President of Azerbaijan Ilham Aliyev on Friday received Pakistani ambassador Inayatullah Kakar, who has completed his diplomatic mission in the country. The Head of State said bilateral relations between Azerbaijan and Pakistan had developed during Inayatullah Kakar`s tenure. President Ilham Aliyev praised participation of Pakistani President Asif Ali Zardari in the 12th summit of Economic Cooperation Organization (ECO) in Baku. The Azerbaijani leader also recalled his meeting with the Pakistani counterpart, during which they mulled the bilateral relations. The President stressed the necessity of strengthening fraternal and partnership relations between Azerbaijan and Pakistan. The Head of State thanked Inayatullah Kakar for his contribution to expanding the bilateral ties. 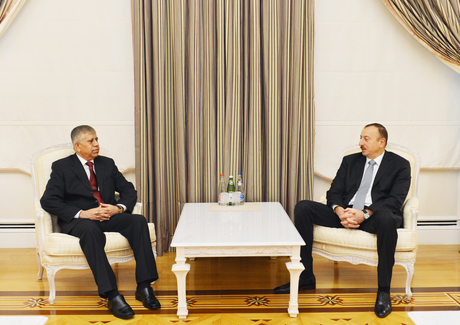 The Pakistani envoy thanked the Azerbaijani government, particularly President Ilham Aliyev for creating favorable conditions during his diplomatic activity.